I make lemonade from bottled lemon juice throughout the year. 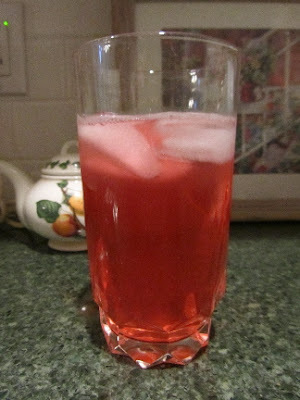 Here is a frugal version of lemonade, for those who grow rhubarb (unless, of course, what you have in your yard are lemons). In spring and summer I stretch the lemon juice concentrate by using a rhubarb infusion for half of the tangy flavoring in lemonade. Rhubarb lemonade tastes more like fruit punch and less like lemonade, but I call it pink lemonade, anyways. Place rhubarb and water in a stainless saucepan. Bring to a boil. Reduce heat and simmer, covered for 15 minutes. Remove from heat and allow to cool. Strain out the rhubarb pieces. Use this infusion for the liquid in your lemonade. 1/3 - 1/2 cup sugar (according to your preference). This makes a little over 1 quart. My cost is about 25 cents (lemon juice and sugar), or about 6 cents for an 8 oz. serving. Compare that to soda pop! I buy the sugar in a 50 lb. sack at the cash and carry wholesaler/restaurant supply for about $29, and the lemon juice in a 32 oz. container at the dollar store, for $1. My savings making it with rhubarb for half of the lemon flavoring, about 6 cents, so okay not huge (won't become a millionaire on that), but still. It's those little things that add up. But mostly, it's such a pretty drink.